APOLLO 125cc Dirt Bike with 4 Gears Manual Transmission, Kick Start, Big 17"/14"
Apollo DB-X18 125cc Dirt Bike with 4-Speed Manual Transmission, Kick Start, Big 17"/14" Tires! FAST!! 125CC 4 Stroke, Single Cylinder, Force Air Cooled Engine, keeps engine temperatures reliably under control, even while idling at stoplights--for maximum efficiency and longer engine life. Manual 4-Speed Transmission Quicker start and much more convenient! Take fully control of the dirt bike, Pro's Choice! 17"/14" Big Front/Rear Wheels, comparing to same 125cc displacement Bike, it's much Higher and Longer, much more ground clearance, it is possible for you to use another 2 more years. Fits for Adults and Big Boys!! The CDI Ignition Better performance and easier to start for optimal use. kick start Start your dirt bike easily and conveniently without worrying about your battery. Twin Spare Heavy Duty Steel frame: much heavier than others, very strong and cannot be broken easily. DB-G009 is the best dirt bike you could get in the market for less than $1000. This bike was designed by experts and used by pros. Our 125cc dirt bikes are the ultimate in competition racing bikes that have a high performance 125cc 4-stroke engine with kick start. With Kick start in stead of electric start, the rider can start the bike easily and conveniently without worrying for troubles caused by electric components. And without electric start, the bike is much lighter, handling our bikes and making big jumps can be much easier. Twin Spare Heavy Duty Steel frame much heavier, stronger and cannot be broken easily. We paid great attention to the balance of our dirt bikes. Front fork, suspensions and tires are special designed and tested. You will have smooth and comfort ride experience with our balanced bikes! The DB-G009 again comes with class leading front and rear hydraulic disc brake, Powerful and durable disc provides excellent braking at any speed; giving you the safety you need. We stock all parts for DB-G009 from manufacturer directly, any problem or any need, simply give us a call and we will service you promptly. Just enjoy and have fun, DB-G009 is the ultimate dirt bike in its class! Your Expert Choice! Carton Dimension 40.50 x 55.5 x 30"
Shipping charge for one single unit of DB-G009 is $199.95(Please login to see real shipping charge for these states: Florida, New York, District of Columbia, Connecticut, Maine, Maryland, Massachusetts, Montana, New Hampshire, New Jersey, Pennsylvania, Rhode Island, Vermont, West Virginia, Delaware, etc.) , and you will get discounted shipping price if you order multiple item. ATV-V003 Promax 125cc ATV with Automatic Transmission w/Reverse, Remote Control! Big 19"/18"Tires! Apollo DB-X19 125cc Dirt Bike with Headlight, 4-Speed Manual Transmission, Kick Start, Big 17"/14" Tires! 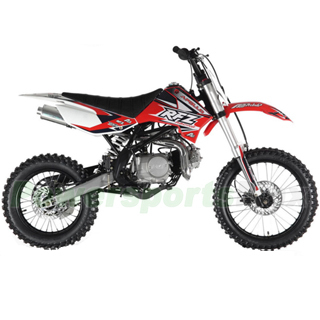 DB-Q002 125cc PitBike with 4-speed Manual Transmission, Hydraulic Disc Brakes, Kick Start! 14"/12" Tires! Apollo Sportrax 125cc ATV with Automatic Transmission w/Reverse, Electric Start, Big 19"/18" Tires! DOT Motorcycle Modular M&M Full Face Helmet - Brown Free Shipping! I'm going to be honest I haven't gotten my bike back yet because I ordered it last night. LOL. I have been riding my buddys here and there and he has had it for over a year now and doesn't skip a beat, we have been keeping up with maintenance and its been perfect since. Another thing I want to note. When I say I bought it last night, I mean at 11:20 PM EST, 8:20 PM PST and I have a different billing address from shipping address and I had to fill out a form that they had to verify before my order could be competed and verified. I'm assuming a server sent me the form to fill out less then 2 minutes later. I fill out and send the form by 11:35 PM EST and not even 2 minutes later before I can reach my bed I get an email from an employee saying the form is verified and the warehouse is processing the order as early as they can tomorrow! Amazing customer service by far. I have not gotten it shipped so I am just reviewing based on the customer service so far. I was impressed with my purchase the quality of the bike is very good coming from a mechanical background. you get what you pay for and this is a great deal when you look at the other bikes out there in the industry. and the outrageous prices they ask for the same product. I think the biggest problem is that people don't take care of their bike and don't follow the maintenance schedule. I was about to purchase from another dealer but their product review and customer service was poor that is why I turned to you. Thanks power sports max for processing my mso request and thank you for sending me the replacement carburetor for my Apollo 125 RFZ. It works flawlessly on my bike. Thanks again guys, I've recommended you guys to anyone interested in pit bikes that has asked me about where got my bikes from. Have a nice day guys. This dirt bike is awesome. My son which is 16 wanted a dirt bike for Christmas so I told him to find on within his Christmas Budget. He found your website and show me. I was skeptical at first I admit. I did some research and decided for that for the money and the fact that it came with a warranty what the heck. I ordered the bike from him. It came earlier than expected and he basically assembled it himself. He has been riding ever since. I would and have recommended PowersportsMax to others. I may even buy another bike from you soon. A very good reliable & powerful bike I have told a couple of people about the bike & they have been looking at the bike & one-off my buddies just recently brought one the DB-009 Apollo DB-X18 125cc it haven't gave a really big problem yet I only had to replace the back tire & that's it I love the bike & the price for the bike you can't beat that. We are totally impressed with bike and Powersports max. We researched for months before buying for our 14yr olds birthday and even the adults can ride good and plenty of power. Really a great deal, we bought the blue and is so sharp and found matching helmet, goggles, gloves. Being Chinese we went over all bolts checked everything and all is great everyone so happy. Honda was 29.9" tall and Apollo is 33.5" tall to top center of seat. Says use minimum 92 octane and can't find but 91 local so mixing NOS additive that raises 3 octane so puts us at 94 octane and working good. This bike is amazing !!! way better than I thought it would be.Lots of power and a great riding bike. I did have one issue, but the team at powersports max was quick to respond to my email and sent out the replacement part. With that being said, I advise if you have any issue to send an email. They will call you back. Trying to reach them by phone is hard to do!! Great large dirt bike. Runs awesome. Very strong. I'm going to be honest I haven't gotten my bike back yet because I ordered it last night. LOL. I have been riding my buddys here and there and he has ..